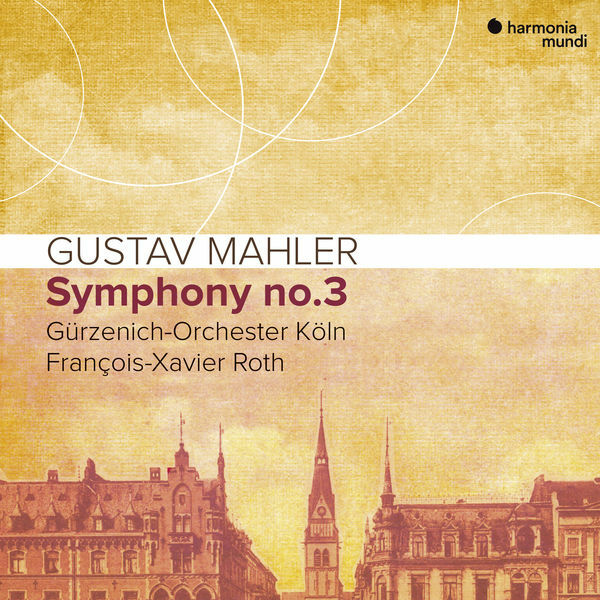 Gustav Mahler Symphony no 3 with François-Xavier Roth and the Gürzenich-Orchester Köln, now at last on CD, released by Harmonia Mundi, after the highly acclaimed live performance streamed a few months ago. The Gürzenich Orchestra gave the world premiere of this symphony in Cologne on 9th June 1902, conducted by Mahler himself, who also conducted the premiere of his Fifth Symphony with the orchestra, in October 1904. Though its personnel have changed, the repertoire remains close to the orchestra's core. François-Xavier Roth follows in the footsteps of Michael Gielen, who conducted the Gürzenich Orchestra and conducted Mahler with the innovative SWR Sinfonieorchester Baden-Baden und Freiburg, where Roth was the final Chief Conductor. 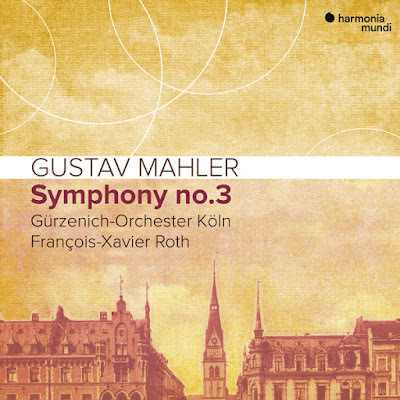 The lucidity of this performance should come as no surprise, especially to those who have been following Roth and the Gürzenich-Orchester Köln over the last few years, and not just in Mahler, though their recording of Mahler's Symphony no 5 is highly recommended. The first movement of Mahler's Symphony no 3 is huge, almost a symphony in itself. Roth grasps its internal structure, bringing out its formidable architecture. The opening theme is strongly shaped, creating the pattern of "peaks" (trumpets and trombones) and "valleys" which are very well defined, muffled trumpets and solo trumpet calling out into the distance, the strings and winds adding sweetness. Roth emphasises the pattern with very quiet, muffled percussion, before the next sequence, where the trombones call, heralding the way ahead. This deliberation respects the marking "Kräftig. Entschieden" but also contributes to the interpretation of the symphony as a whole. From steady discipline, the symphony progresses : the apotheosis at its conclusion is reached only by a process, which includes struggle as well as moments of loveliness. As if the goal were in sight, the pace speeds up towards the end of the first movement : turbulent excitement, hurtling forwards, winds, trumpets and trombones leading into the next phase,buoyed up by cheerful, almost swaggering woodwinds. If Mahler's entire output can be heard as one great symphony, its basic ideas repeated and developed, the first movement of the Third Symphony is a microcosm in itself. Mahler's original title for this movement was "Pan Awakes, Summer Marches In". Even without the label, it's clear from this performasnce what he meant : vigour and freshness. The second part of Mahler's Symphony no 3 begins with a movement "tempo di minuetto", a dance between two partners, extending the pattern in the first movement, but also evoking the idea of dialogue that rises so often in Mahler, even up to the Adagio from what would have been his Tenth Symphony. The dance element brings out the best in Roth, given his background in French repertoire, so strongly influenced by the patterns of dance and precision. Elegance does count in Mahler and highlights the subtlety in his orchestration. This pays off too in the third movement, where details like the quote from the Wunderhorn song Ablösung im Sommer ("Kuckuck ist tod!") aren't there simply for decoration. In the song, summer is not over, though the cuckoo is dead, since the Nightingale takes over and "singt und springt, ist allzeit froh, Wenn andre Vögel schweigen". As in so much of Mahler's work, death is not an end but a stage in a process, where death is defeated by new forms of life. Thus the flutes and piccolos, giving context to the posthorn. This is heard from offstage, invisible but powerful. Does it suggest distance, or memory or future hope ? The "kuckkuck ist tod" figure returns, cheekily and leads the orchestra into another dance, whipped almost into frenzy, before the posthorn calls again, and the pace descends, like twilight into night. Yet again, the resurgent pattern returns, with a finale of energetic affirmation, not defeat.